The lovely island of Oahu is overflowing with natural wonders. The sunsets here are like no other, and the beaches are nothing short of magnificent. Oahu is also home to several waterfalls that range from gentle cascades to rushing torrents that tumble down into lush valleys. Many of these waterfalls are accessible to the public via hiking trails. Keep reading to learn out about some of the best waterfall hikes on Oahu! You’re sure to work up an appetite trekking through the lovely Hawaiian landscape. Or, perhaps you’ll want to explore more of the island. Either way, Oahu has so much to offer that deciding what to do next may be daunting. We can help! Download our complimentary Oahu Travel Guide and browse through our curated collection of top restaurants, events, and activities like waterfall hikes on Oahu. It has helped so many travelers make the most of their dream vacation in Hawaii! Each of Oahu’s unique regions features something different for visitors to enjoy. Though many of the area’s best waterfalls are peppered throughout the Southeastern and Northern sections of the island, you’re never far from a spectacular waterfall (no matter where you stay on Oahu). Here are just a few of our favorite Oahu waterfall hikes! The trail that leads to Manoa Falls is well-maintained, but certain areas are challenging to inexperienced hikers. We recommend that you take your time walking to and from the falls so you can soak in the beautiful sights surrounding you. It’s no wonder scenes from Jurassic Park and LOST were filmed here! You’ll want to wear comfortable shoes for this hike, as you’ll need to traverse over roots, rocks, and a stream. It’s worth it, as this rewarding hike lends you the opportunity to see some breathtaking views of the island and the lovely cascade at the trail’s end. The trail to Likeke Falls is not maintained by the state, so it’s not well marked and therefore harder to follow. But, making your way to the cascading water it’s worth it — it feels like a “secret” waterfall. If you make this trek, expect to get very muddy, especially after rain. You can begin your hike from different locations, including from Nuuanu Pali Lookout, which is a popular scenic destination itself. The beautiful North Shore’s Waimea Falls (also known as Waihi Falls) is located in the Waimea Valley, a botanical garden managed by the Audubon Society. If you opt for this hike, you will be treated to magnificent gardens and historical sites along the way. You can also swim in the pool under the falls. Waimea Valley is open daily between 9 a.m. and 5 p.m. 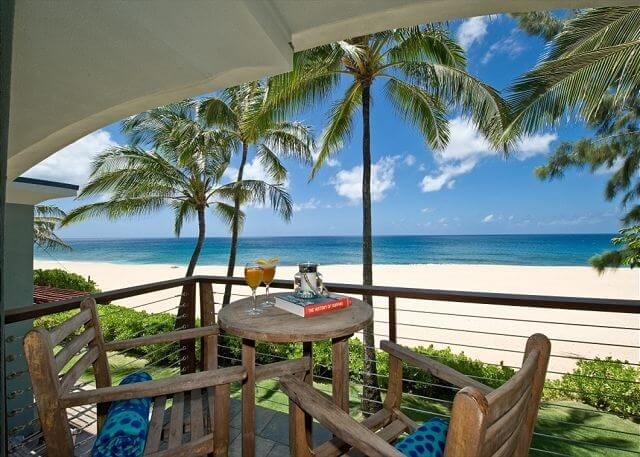 Surround Yourself in Natural Beauty at a Hawaii Beach Homes Vacation Rental! Waterfall hikes on Oahu are exciting adventures you’ll want to experience with all of your family and friends. 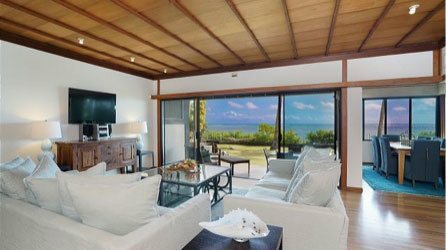 After a fun day of exploring, there’s nothing finer than returning to your Hawaii Beach Homes vacation rental, where you’ll continue to enjoy incredible ocean views. 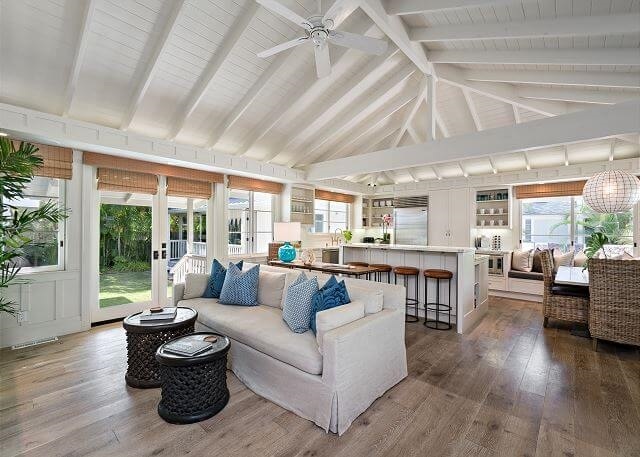 Our properties on the North, South, and East Shores of Oahu seamlessly blend luxury with natural beauty. We also offer plenty of special offers and discounted rates on our homes to help you save money for making memories on the island! If you need help deciding where to stay on Oahu, be sure to take our free quiz! 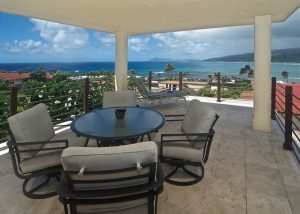 The SkyHouse on the South Shore of Oahu is in a fabulous location. You can walk to the beach, or take a short drive to access one of the most beautiful coastal roads on the island. The SkyHouse is a perfect spot if you are traveling with a group, as it can comfortably fit up to eight guests. Plus, this home boasts clear views of the deep blue Pacific from nearly every vantage point! It’s the perfect place to experience a famous Oahu sunset. Ready for the ultimate island adventure on Oahu? Book a stay today and start planning your trip while there’s still time! We look forward to hosting you. If you like the idea of our waterfall hikes, you’ll love our lighthouse hikes on Oahu, too! 5 of the Best Lighthouse Hikes on Oahu — Why Is the Ala Moana Shopping Center So Famous?